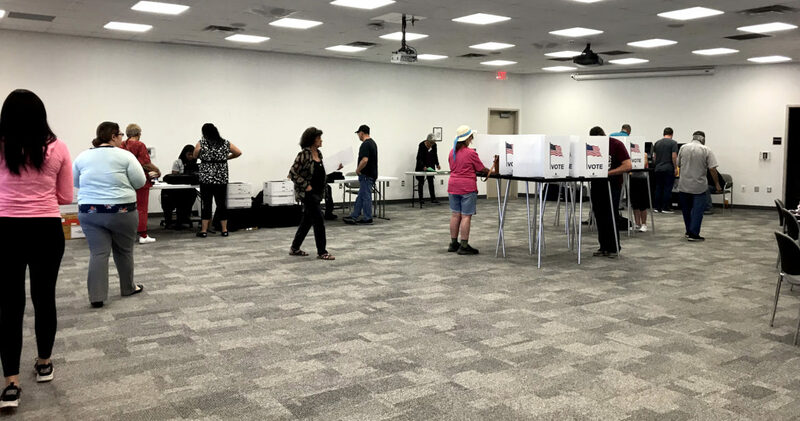 Voters go to the polls at Thomas Brannigan Memorial Library in Las Cruces on Tuesday, June 4. Eligible voters already can register or update their registration when applying for or renewing a driver’s license or identification at the Motor Vehicle Division. House Bill 84 would make that process automatic, with an opt-out option for those who don’t want to register. The bill is sponsored by Sen. Jeff Steinborn, D-Las Cruces, and Democratic representatives from Albuquerque and Corrales — Daymon Ely, Debra Sariñana, Patricia Roybal Caballero and Joy Garratt. “I think it will bring more people to the polls. It’s easier, automatic, and that’s what we want,” Sariñana said. Heather Ferguson, executive director of Common Cause, a nonpartisan advocacy group, says updating New Mexico’s registration system is important. “Modernizing New Mexico’s outdated system helps voters by identifying errors that could prevent their vote from being counted and saves election officials money because they don’t have to process paper applications,” she said. Ferguson also said switching to an electronic system would help keep the integrity of elections by strengthening the security of the state’s voting systems. At the House State Government, Elections & Indian Affairs Committee hearing this morning, one of the biggest concerns was ensuring that only qualified electors be registered. Secretary of State Maggie Toulouse Oliver assured the committee that the MVD does have processes in place currently to ensure that only those qualified are registered. Since 2015, a wave of states have implemented automatic voter registration, beginning in Oregon. Currently, 15 states and the District of Columbia have automatic voter registration. North Carolina and Maryland have same day registration available at early voting sites, but not on Election Day. According to the Brennan Center for Justice, a national group that studies and advocates for such reforms, 100,000 of the 230,000 individuals who had registered automatically cast ballots in the 2016 Oregon election. The same group of legislators also want voters to be able to register when they show up at the polls, on Election Day and at early voting sites. There’s strong evidence, according to the National Conference of State Legislatures, that same day registration increases voter turnout, with an average boost of 5 percent. Key requirements in all of the states that allow same day registration is proof of residency and voter identification. House Bill 86 includes similar provisions. Voters would have to show a New Mexico issued driver’s license or identification card, or a different form of photo identification that is coupled with a document showing a valid, current address. The bill also required same day registration happen in the precinct in which the person resides on election day, or if they’re voting early, in the same county in which they reside. The automatic voter registration bill passed the committee 5-4 today and is now headed to House Judiciary. The debate on same day and early voting registration will continue on Monday. Ximena Tapia is New Mexico In Depth’s 2019 Academic Fellow from New Mexico State University. Reporters and editors, are you looking to up your political-reporting game? The folks from FollowTheMoney will be in Santa Fe this Wednesday, Jan.